i totally disagree with the comment, trampled underfoot is very nice, and they know exactly where they are going ! (i'm ok with sibly ), a lackluster performance ? i'm sure the person who wrote the comment is one of those frustated fans who think that the 1980 gigs are all fails. I'm ok it's just less explosive than the 1973 gigs but it is more melodious, there's some fail, like the sibly of this show, but StH is just incredible, Black Dog- Rock'n'Roll- Trampled- ALS- are played at the lightning speed, which sound more aggressive. You can also say that in All my love plant missed the lyrics, he repeats two times the same verse but it sounds nice. The Raing song is introduced as the song talking about the "holy time", it's the first time Robert is talking in that way about this song, and it's also a nice performance. My feelings on this show are in between FRX's and the above commenter's. Overall, I agree that STH is really good, but Jimmy makes some mistakes in the solo and the end part is a bit weak. I only hear one small misstep in TU. 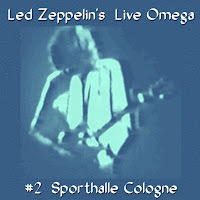 SIBLY is not that bad, given Page's out-of-tune guitar. They make up for it well, IMO. I would call this an "OK" show. The band generally seems "into it". On some other 1980 shows, I hear way more apathy.